Payments are processed via a Secure PayPal shopping cart. Paypal is an eBay owned company that allows you to make safer and more secure payments online with your credit card or bank account. We are a Paypal Verified business and you are covered by Paypal’s buyer protection which will protect you for all purchases upto $500. You do not need a PayPal account to make a payment if you are using a credit card. 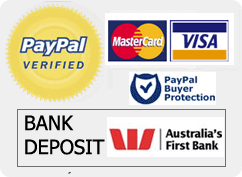 However if you are using bank deposit, you will need to set up a Paypal account which is very quick to set up. We do not receive or record your banking or credit card details as the payments are processed by PayPal so you can shop knowing that your private details are safe and protected. A PayPal account is not necessary to make a purchase. Payment can be made via PayPal using any major credit card, without the need to have a PayPal account. If you would like to make payment without logging in to PayPal or signing on for a new account, just click on the "Secure Checkout" button on the left half of the page. This will bring you to a form where you can fill in your credit card information and credit card billing details and complete the payment without logging in to PayPal. PayPal is a secure and trusted payment processing service which allows you to shop online. PayPal can be used to purchase items by Credit Card (Visa, MasterCard and Debit Card. 1. Safe:PayPal hides your financial details so you don't have to share them online. We also protect your purchases so just in case there's a problem, you can get your money back. 2. Fast:PayPal lets you pay in a few easy clicks. No hassle of getting out your wallet or typing your card details into different sites. All you need is your email address for quick, easy payment. 3. Everywhere:PayPal is accepted at thousands of websites, from leading brands to small independent retailers. So wherever you shop, look for the PayPal logo to pay the safer, faster way.